Spreadsheet (Excel file, .xls) of Wharton’s papers and correspondence at research libraries, including contact information. Updated 5/17/13 with new information. Thanks to Amy M. Kimball of the Sheridan Collections at Johns Hopkins University and Nynke Dorhout at The Mount for making this information available. Research help for students is available on the Student Queries page and the Teaching Wharton page. Queries and replies at this site. Summaries and Discussion Questions for Wharton’s Major Texts are now available at the Wharton Society site. Illustrations from the first edition of The House of Mirth are now available at the Wharton Society site. Abby Werlock’s biographical sketch of Wharton and a chronology of Wharton’s life at the Wharton Society site. 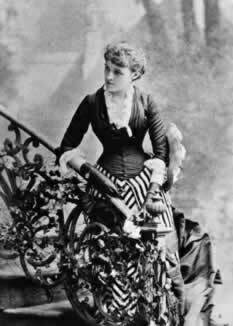 Edith Wharton in the News: Quotations by and about Edith Wharton. A parody of Edith Wharton’s style by Donald Ogden Stewart. The Mount: Edith Wharton and the American Renaissance . This content-rich and well-researched site is worth a visit. Edith Wharton in Lenox contains many pictures of The Mount and Wharton’s life there, including her servants. The Edith Wharton page at the popular “Domestic Goddesses” website contains links, pictures, and a biographical sketch drawn from R. W. B. Lewis’s 1975 biography of Edith Wharton as well as graduate student essays selected by Kim Wells, the site owner. Edith Wharton’s World . An outstanding photo exhibit at the Smithsonian curated by Eleanor Dwight and Viola Hopkins Winner. Edith Wharton: A Life in Pictures and Text offers a brief overview of Wharton’s life and a test-yourself quiz for undergraduate students.